I just had to share how amazing the Sonos Play 3 is. We have had so many problems finding a wireless system that works in our home. There are so many benefits to living in the country, the glorious views, peace and tranquility. However a major drawback of rural living is the Wi-Fi. It is rubbish, some days it works fine and others drops in and out all day. I can manage on the Internet, but do occasionally have to re connect. When we decided to get a wireless speaker we didn’t really consider it would be an issue, our wired speaker we had previously used was a quality brand and had always been fantastic so we decided to go with the same brand. We excitedly unpacked and set it up (I know but we are real technology geeks) and it was wonderful for an hour, after this is was terrible, constantly dropping in and out. It buzzed if you got a text message, and went off every time one of the boys used their iPads. It was totally unusable; we had to send it back. One of my closest friends had recommended Sonos; we were doubtful after our previous bad experience but thought we would give go. But wow it is amazing; you see Sonos is totally different and so clever. It works by creating its own network. This means in areas like ours where you get constant drop out due to low-bandwidth, and lots of devices on the network, Sonos is still able to provide seamless streaming. The quality is not affected by all the other devices. The amazing about Sonos, is you that can connect it to you pc, your phone and I pad, this enables you to control it from wherever you are in the house. It also works perfectly with Napster, I am going to write a little post on this separately, but lets just say if I cancelled Napster I think the Boys might leave home, in brief Napster is a music subscription site that allows you to play and download unlimited music to listen to on and off-line, enableing us all to have constant acccess to all the latest music to suit all of our tastes. I can’t believe the difference this speaker has made. We are now able to play music wirelessly via Napster at all times, even if the boys are on their I pads and x boxes the Sonos is still working. I love the fact I can turn it up and down or change the music via the app. It is also possible to connect more speakers to the system, so you can have a speaker in every room. And this is what is so great; you can play the same music in every room through your system. Or, through the same app play different music through each and every speaker you connect, its incredible. Perfect for families with different music tastes and it can all run off of one system. I am so pleased we have found something that works, without having wires all over the house. Sonos is the perfect wireless system for the busy family, perfect for those living in rural areas, or networks like ours with many devices running at the same time. And also perfect because it is just so cool. Ah thank you, Yes Napster is similar to Spotify but you can download it to your devices phones etc to use offline too, which I love. We LOVE Sonos, hubby has managed to sort so we can use at the top of the garden in summer too. We love it! Big fans! We need something like this! I love that it has its own network too as our wireless is shocking!! 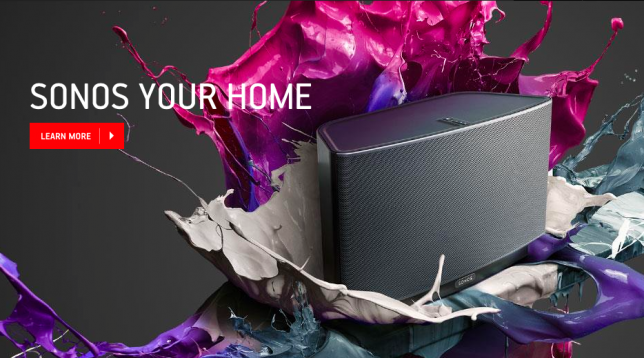 We have a Sonos and LOVE it – the only problem is…. now we want more! !